Stay Updated on Your Stock Levels at All Times. 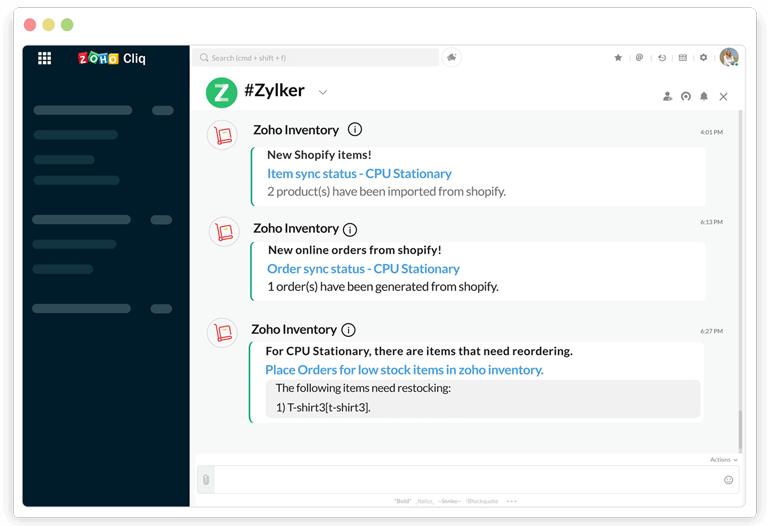 Connect Zoho Inventory and Zoho Cliq to get chat notifications on your inventory levels and get notified on the low stock items, sales orders, and items sync status of all your online marketplaces and more. 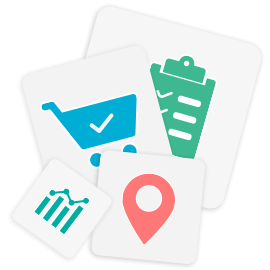 Zoho Inventory is an advanced inventory and order management software that lets you centralize your inventory system and automate your business' entire order-to-cash process. With timely notifications on important updates from your selling channels, you can have better control and always be informed about your stock levels. Make your order management more efficient with timely fulfillment of orders as Zoho Inventory sends a notification to Zoho Cliq whenever new sales orders are synced with your online marketplaces. 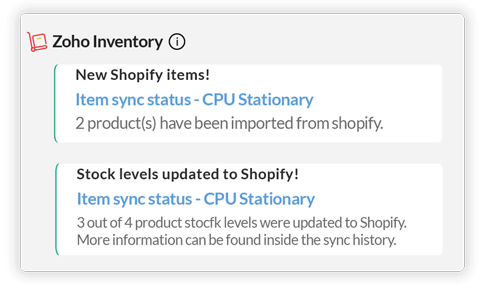 Get notified of the new items that are synced to Zoho Inventory from your marketplaces and on changes in stock levels from time to time, so that you're always updated on what's coming in and moving out. Never miss out on sales due to stock outs. 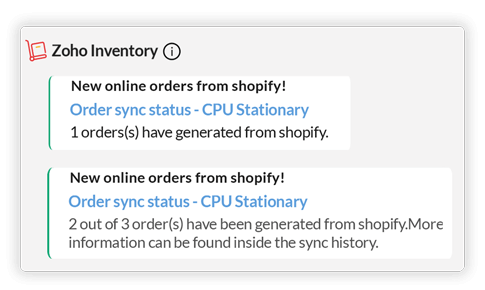 Get notifications of items that are below reorder levels. 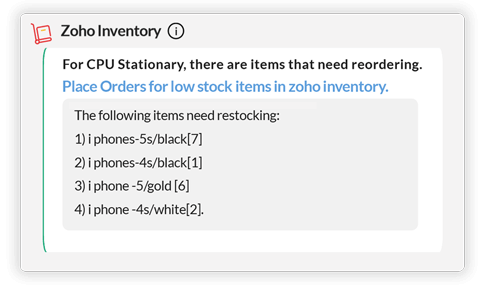 Log in to your Zoho Inventory account. Select the organization for which you would like to receive related notifications in Zoho Cliq. Select Integrations on the left pane on your dashboard and then, click on Chat. Click on the Connect to Zoho Cliq button to enable the integration. Make multichannel selling easy for your team with notifications on the most effective collaboration channel.